The wildflower season is well underway in the Bay Area. Although February is usually for the early flowers, the sunny days may have hasten some blossoms. The lack of rain seems to also have kept the grasses short so the flowers are more visible. Get up and out early is the rule for wildflowers because surely before noon the wind will pick up and make it difficult or impossible to photograph the splendid colors atop thin steams ever waiting for a little breeze to set them in motion, dancing on the hillsides or in the meadows. There are some wonderful finds right now on the Fairfax-Bolinas road below Mt. Tamalpais. You will find pull outs quite often and a variety of floral subjects everywhere: Douglas Iris, Morning Glory, Wallflowers, Milkmaids, Star Lilies and a few Mission Bells. The backgrounds are pretty busy so you will want to isolate your subjects by making sure the background is at a distance and in the shadow. I like to use a shaded background so it goes very dark or black. Sometimes you have to get into very “contorted” positions to achieve this angle. For both of these images I was still getting some distraction in the background so I chose to use a ring light flash. I used a diffuser for the Mission Bell because the sun was very bright and then filled in the shadowing areas of the bloom with the flash. The Mission Bell is found among oak and brush, but you must look closely to see it because it blends in with the background. 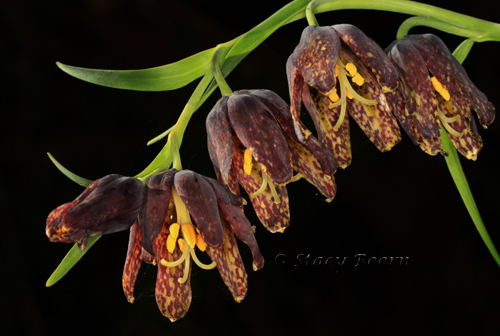 Another name for these bowl shaped flowers is the “checker lily.” The roots of the Mission Bells were eaten and used in medicines by Native Americans. Also in the Lily Family near by were many Star lilies on the rocky outcrops. This is a very showy flower with multiple star shaped flowers. 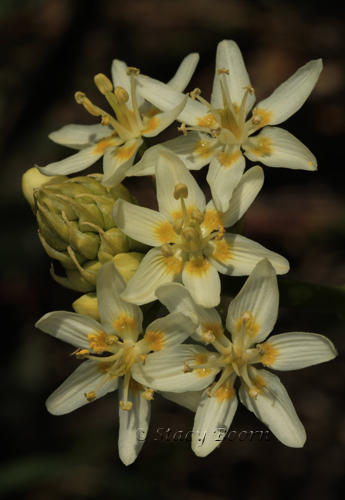 Since all parts of this flower are poisonous another common name is the Death Camas.